Aberporth is a delightful coastal village sitting on the southern edge of Cardigan Bay in West Wales. Previously a busy fishing port, this quiet picturesque location is now a superb place for a family holiday or a relaxing break for couples. Aberporth has all you could wish for in a seaside village: sandy beaches, cosy pubs serving delicious meals, several restaurants and takeaways, a great beach café for those all-important ice creams and a scenic coastal path. The beaches at Aberporth have been awarded the European Blue Flag status and are perfect for sunbathers, swimmers, and canoeists. Low tide also provides the opportunity for children to explore the rock pools. One of the beaches is dog friendly and is also used for launching boats, including local fishing boats. Dolwen, the more southerly beach, is watched over by a large carving of a dolphin, hinting that dolphins as well as seals can often be seen close to shore. Dolwen is normally patrolled by a lifeguard during the summer school holiday period. There is car parking available and toilets including facilities for disabled visitors near the beaches. Aberporth offers an ideal base for walkers wishing to explore the Ceredigion section of the Wales Coast Path: it goes through the village and you can follow it south to the National Trust beach of Mwnt and on to Gwbert and Cardigan. To the north, the first section of the recently improved path is wheelchair friendly and it is an easy walk to Tresaith which has a sandy beach and another seaside pub with stunning views across Cardigan Bay. Continue north to the beaches of Penbryn, Llangrannog and New Quay, on to Aberystwyth and finally to the mouth of the River Dovey at Ynyslas. Most holiday cottages are conveniently located within easy walking distance of the beaches and village amenities and there are many things to do nearby. For the active there is cycling, surfing, golf, quad bikes, shooting, paintball and white water canoeing. The area is renowned for its fishing: fly fishing on the nearby River Teifi, local lakes for trout and coarse fishing and excellent sea fishing from beach and boat. The whole length of Cardigan Bay's Heritage Coast is a short drive away. Boat trips from New Quay to see the dolphins and other wildlife or to fish are popular. Ceredigion and the Teifi valley have lots of historic sites, museums, farm and theme parks and steam railways. This region has a thriving cultural identity which includes a passion for good food. Take a ‘Taste Trail’ and discover some of the wonderful food and drink produced here. Further afield, day trips are possible exploring the Cambrian Mountains, the Preseli Hills or Pembrokeshire resorts such as St Davids, Saundersfoot and Tenby. If you don’t want to drive there is a bus service to Cardigan or Aberystwyth from the village. Aberporth’s maritime history dates back to the 16th century when cargoes such as salt, coal, and limestone were imported here. Later the main fishing industry was based on herring until the decline of fish stocks around the time of the First World War. Today fishing in Aberporth is on a much smaller scale, with lobster and crab being the main catches. The peaceful and friendly atmosphere of this seaside village, along with its two golden sandy beaches, make Aberporth a wonderful destination for holidays at any time of the year. 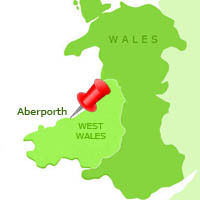 See more things to do near Aberporth. Looking for somewhere to stay in Aberporth? See holiday cottages in Aberporth.